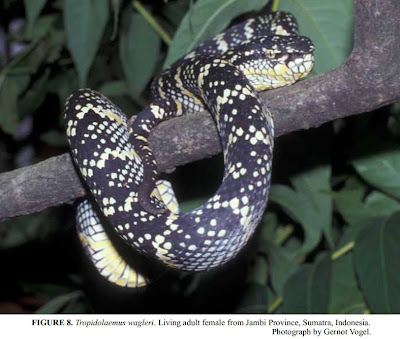 In this first paper of a series of three, the taxonomy of the Asian pitvipers of the genus Tropidolaemus is re-evaluated on the basis of morphological analyses. 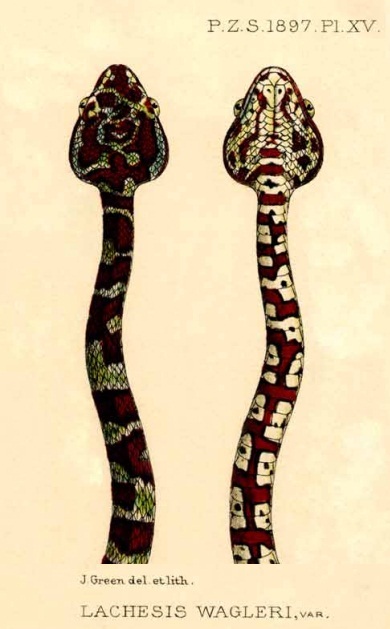 Variation in morphological characters was investigated on the basis of specimens from the whole range of the pitviper currently known as Tropidolaemus wagleri (Boie, 1827). Our results, based on morphological univariate and multivariate analyses, define three clusters of populations that are morphologically diagnosable and which are here considered to represent distinct species following the Biological Species Concept and the Phylogenetic Species Concept. After a review of available names among the list of synonyms created during the confused taxonomical history of the genus Tropidolaemus, it appears that Tropidolaemus wagleri (Boie, 1827) is the valid name of the first cluster which includes populations inhabiting Southern Thailand, West Malaysia, Sumatra, Nias, Mentawei Archipelago and Bangka Island (but not Belitung). In order to stabilize the binomen, we select and describe a neotype for Tropidolaemus wagleri. A second cluster, for which the binomen Tropidolaemus subannulatus (Gray, 1842) is available, includes in this preliminary step populations from Borneo, Sulawesi, Sulu Archipelago and the Philippines. Its detailed taxonomy will be addressed in the second paper of the series. Lastly, the third cluster includes specimens from Mindanao Island, Philippines, recognized here as Tropidolaemus philippensis (Gray, 1842). - Tropidolaemus wagleri (Boie, 1827): valid combination for western populations, namely Thailand, West Malaysia, Sumatra, Bangka and Mentawei Archipelago. - Tropidolaemus subannulatus (Gray, 1842): valid combination for populations of the Philippine Islands and any, or all of the eastern populations which might be conspecific with Philippine populations, at the exception of Tropidolaemus philippensis and Tropidolaemus laticinctus Kuch, Gumprecht and Melaun, 2007. - Tropidolaemus philippensis (Gray, 1842): valid combination for some populations of southern and western Mindanao Island, Philippines. - Tropidolaemus celebensis (Gray, 1849): available name for any population inhabiting Sulawesi which would prove to be distinct from Tropidolaemus subannulatus as defined here and from Tropidolaemus laticinctus. - Tropidolaemus immaculatus (Peters, 1872): available name for any population inhabiting Borneo which would prove to be distinct from Tropidolaemus subannulatus as defined here. - Tropidolaemus alboviridis (Taylor, 1917): available name for any population inhabiting Negros and adjacent islands, which would prove to be distinct from Tropidolaemus subannulatus as defined here. 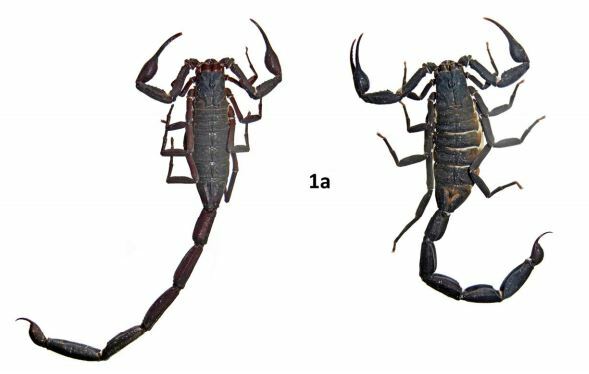 - Tropidolaemus laticinctus Kuch, Gumprecht & Melaun, 2007: valid combination for some populations of Sulawesi, not conspecific with Tropidolaemus subannulatus as defined here. Vogel, G.; David, P.; Lutz, M.; van Rooijen, J. & Vidal, N. 2007. Revision of the Tropidolaemus wagleri-complex (Serpentes: Viperidae: Crotalinae). I. Definition of included taxa and redescription of Tropidolaemus wagleri (Boie, 1827). Zootaxa. 1644: 1–40. FIGURE 1. Color plate of Boulenger's variety "E" of Lachesis wagleri showing the holotype of Tropidolaemus laticinctus (BMNH 96.12.9.80 from "between L. Posso and Tomini Bay, Celebes" [= between Lake Poso and Tomini Bay, Province of Sulawesi Tengah, Indonesia]). Drawing and lithography by J. Green, from Boulenger (1897: Pl. XV). The Asian Temple Pitviper Tropidolaemus wagleri is a widespread polytypic species complex with a complicated taxonomic history, a lengthy species synonymy list, and a geographic distribution encompassing Vietnam, Thailand, Malaysia, Singapore, Brunei, portions of Indonesia, and the Philippines. As a prelude to a comprehensive review of this species complex, we describe a new species of Temple Pitviper based on five historic museum specimens from the Indonesian island of Sulawesi. The new species can be distinguished from sympatric members of the Tropidolaemus subannulatus complex and other congeners on the basis of its conspicuous color pattern and scalation characters. Available collecting data suggest that the new species has a wide distribution in rainforests and lower montane wet forests of Sulawesi Utara and Sulawesi Tengah provinces. 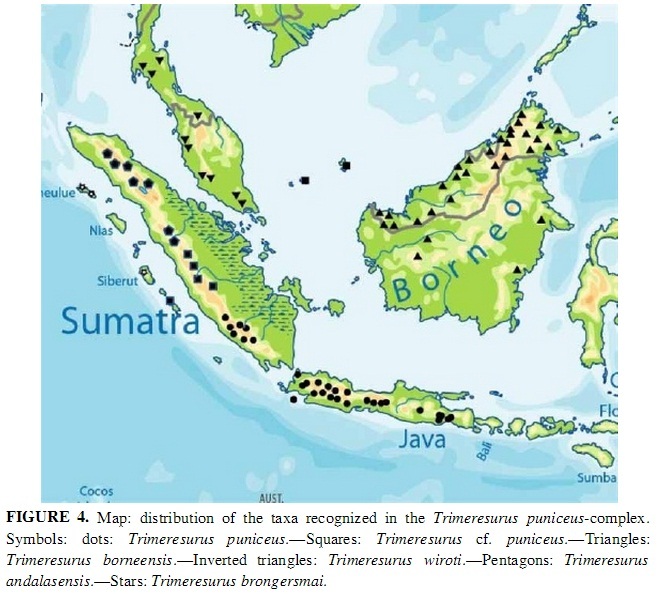 Distribution and habitat: Tropidolaemus laticinctus is so far known only from the Indonesian Provinces of Sulawesi Utara and Sulawesi Tengah in northern Sulawesi island (fig. 12). Available information on collecting localities place this species in lowland to lower montane rainforest. The vertical distribution of the new species extends from near sea level (Paleleh) and about 100 m (Matinan Mts.) to at least 550 m above sea level (1800 feet, at Sonder, Sulawesi Utara; Boulenger ). A specimen in Dumoga Bone National Park (Sulawesi Utara) was observed close to a small river (T. Ahnby, personal communication; fig. 11A+B). FIGURE 11. A+B: Live Tropidolaemus laticinctus from the western side of Dumoga Bone National Park, about 30 km northeast of Gorontalo, Sulawesi Utara, Indonesia. Photographs by Tommy Ahnby. C: Live adult female member of the Tropidolaemus subannulatus complex from northern Sulawesi showing narrow white and bluish bands and spots on uniform green ground color, and tail tip with distinct pattern of nearly equidistant, narrow black and white bands on brownish to greyish ground. Photograph by Andreas Gumprecht. Kuch U, Gumprecht A & Melaun C. 2007. A new species of Temple Pitviper (Tropidolaemus Wagler, 1830) from Sulawesi, Indonesia (Squamata: Viperidae: Crotalinae). Zootaxa. 1446: 1–20. FIGURE 2. Upper: Holotype of Popeia buniana, ZRC 2.6176, adult male from the Tekek-Juara Trail. Lower: Adult female: LSUDPC 1135 from Gua Tengkok Air. Collected, released, and photographed by P. Hein. 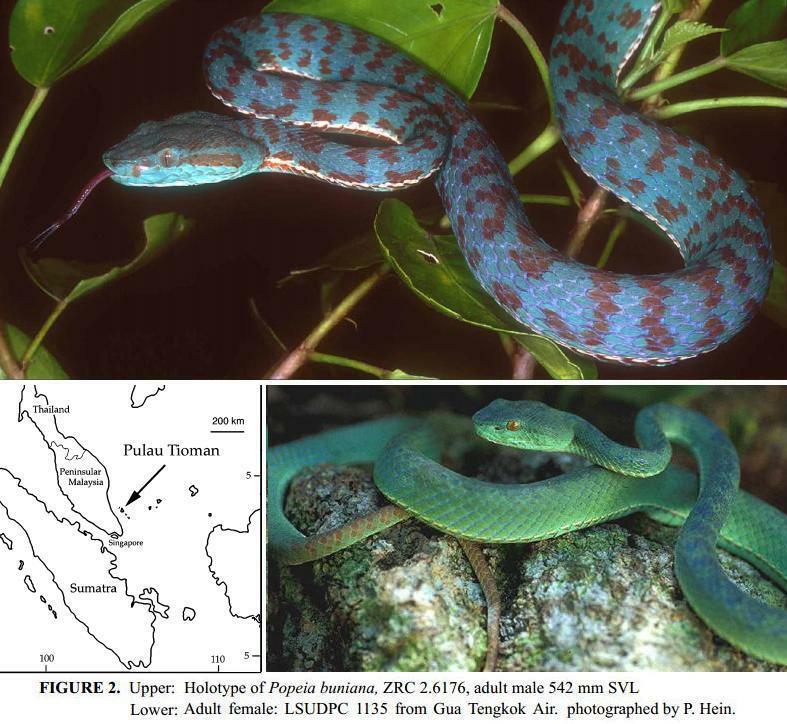 We describe a new species of pitviper Popeia buniana from Pulau Tioman, Pahang State, West Malaysia based on it having unique aspects of scalation, body proportions, and color pattern. 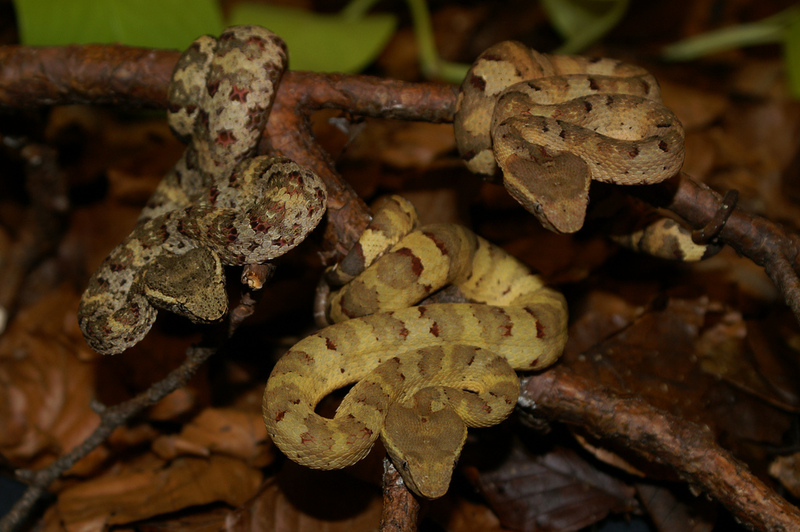 Its long, thin body is in contrast with the shorter, more robust bodies of other arboreal pitvipers, suggesting it may be an active forager rather than an ambush feeder. Its close relationship to P. barati and P. sabahi of Sumatra and Borneo, respectively, rather than with species of the adjacent Malay Peninsula is in accord with biogeographic patterns of other flora and fauna endemic to the islands of the Outer Arc of the Seribuat Archipelago. "her" forest. Therefore, in deference to this belief, we honor the bunian with the feminine patronym buniana, a noun in apposition meaning “Fairy Pitviper”. Distribution. Popeia buniana is only known from Pulau Tioman (Fig. 3), a small island located 38 km off the southeast coast of Pahang State, West Malaysia. The addition of P. buniana to the herpetofauna of Pulau Tioman raises the number of endemic species of reptiles and amphibians on Pulau Tioman to 12 (Grismer 2006). Grismer L. L., Grismer J. L. & McGuire J. A., 2006. A new species of pitviper of the genus Popeia (Squamata: Viperidae) from Pulau Tioman, Pahang, West Malaysia. Zootaxa. 1305: 1-19. 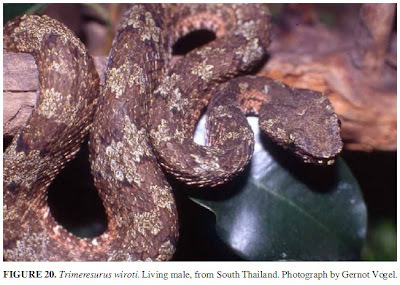 The brown Asian pitvipers of the genus Trimeresurus related to Trimeresurus puniceus (informal Trimeresurus puniceus-complex) are revised on the basis of morphological and molecular analyses.Variation in morphological characters were investigated among 119 specimens from 62 populations of the whole range of the pitvipers currently known as Trimeresurus puniceus (Boie, 1827), Trimeresurus borneensis (Peters, 1872) and Trimeresurus brongersmai Hoge, 1969. 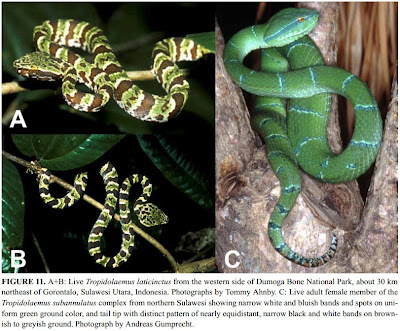 Molecular andmorphological analyses clearly differentiate two groups of taxa, referrable to the informal Trimeresurus puniceus -group and Trimeresurus borneensis-group, and confirm the distinct specificstatus of T. puniceus and T. borneensis. Morphological univariate and multivariate analyses differentiate six clusters of populations that are morphologically diagnosable, of which five are here considered to represent independent lineages and one is placed incertae sedis pending the availability of further specimens. 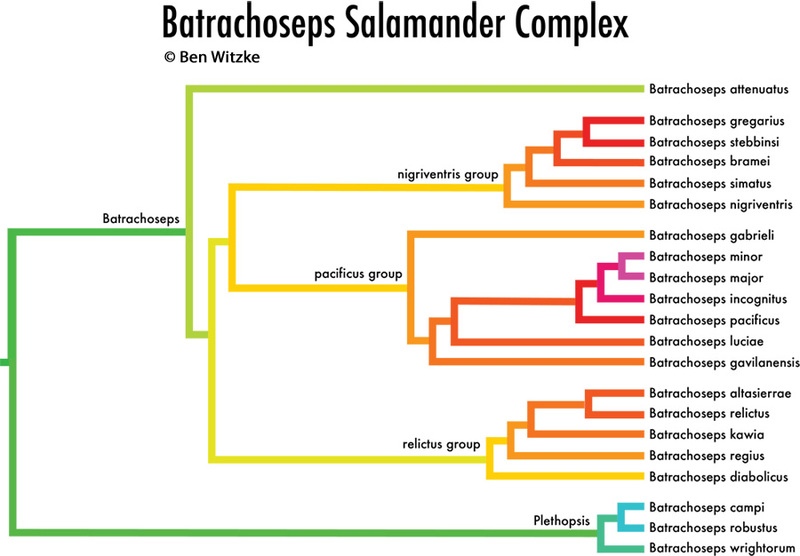 These clusters are considered to be distinct species following theBiological Species Concept and the Phylogenetic Species Concept. One of them is described as a new species, Trimeresurus andalasensis spec. nov. (T. borneensis-group), which includes populations from northern Sumatra. Trimeresurus wiroti Trutnau, 1981 is revalidated to accommodate populations from Thailand and West Malaysia. Trimeresurus borneensis is here considered endemic to Borneo. Trimeresurus puniceus is known from Java and from SouthSumatra, but the taxonomy of this species in Sumatra is left unresolved. Also left unresolved is the taxonomic position of specimens from western Sumatra and the Mentawai Archipelago, and fromthe Natuna Islands and Anamba Islands. Although belonging to the T. puniceus-group, they showsome differences to other specimens of the group. They are not referred to any taxon pending thecollection of additional specimens. Lastly, Trimeresurus brongersmai is confirmed as a valid species from the Mentawai Archipelago. A key to these taxa is provided. Etymology. The specific nomen is the Latin genitive noun forged on Andalas, the ancient name of Sumatra. Suggested English name: Sumatran palm pitviper. FIGURE 4. Map: distribution of the taxa recognized in the Trimeresurus puniceus-complex. Range. INDONESIA. Sumatra Island. Province of Aceh. Known from Blangkejeren, Gunung Leuser National Park, Ketembe, Takengon; Province of Sumatera Utara . Recorded from Toba Massif; Province of Sumatera Barat. Recorded from Gunung Gadut and “Padang Highlands”. This species is endemic to the mountainous areas of northern and western parts of the island. Specimens recorded by Matsui et al. (1984) from Mt. 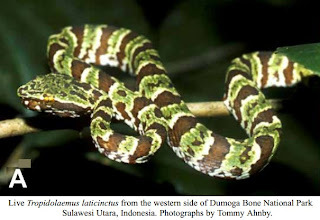 Gadut, Sumatera Barat Province, are here referred to as Trimeresurus andalasensis spec. nov. on the basis of scalecounts provided by these authors. One of them is described as a new species, Trimeresurus andalasensis spec. nov. (T. borneensis-group), which includes populations from northern Sumatra. Trimeresurus wiroti Trutnau, 1981 is revalidated to accommodate populations from Thailand and West Malaysia. Trimeresurus borneensis is here considered endemic to Borneo. 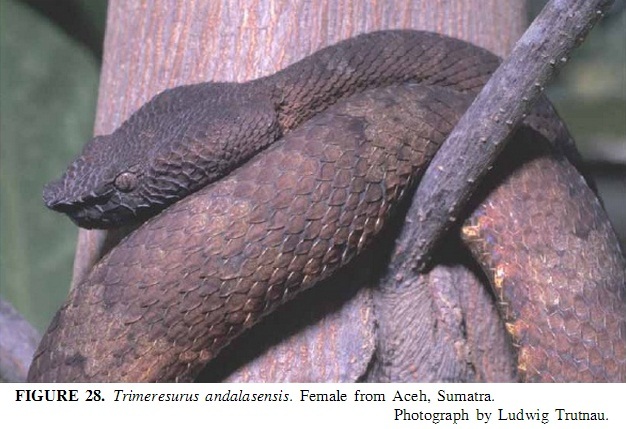 Trimeresurus puniceus is known from Java and from South Sumatra, but the taxonomy of this species in Sumatra is left unresolved. Also left unresolved is the taxonomic position of specimens from western Sumatra and the Mentawai Archipelago, and from the Natuna Islands and Anamba Islands. Although belonging to the T. puniceus-group, they show some differences to other specimens of the group. They are not referred to any taxon pending thecollection of additional specimens. Lastly, Trimeresurus brongersmai is confirmed as a valid species from the Mentawai Archipelago. A key to these taxa is provided. Trimeresurus wiroti Trutnau, 1981: 188, 139: Fig. 43. Type locality. “Khao Wang Range, at an elevation of between 500 and 1196 m, near villages of [...] Ban Hui Hip and Amphoe Lan Saka”(Trutnau, 1981, translated from German), Nakhon Si Thammarat Province, Thailand. The typelocality was precised by Nutphand et al. (1991: 151) as: “Ban Hui Hip near Khlong Wang Hip, Amphoe Chawang, Changwat Nakhon Si Thammarat (Hui Hip village near Wang Hip canal,Chawang County, Nakhon Si Thammarat Province), approximately 8°30’N, 99°30’E”, Thailand. Nutphand, W., Cox, M.J., Trutnau, L. & Smith, H.M. 1991. 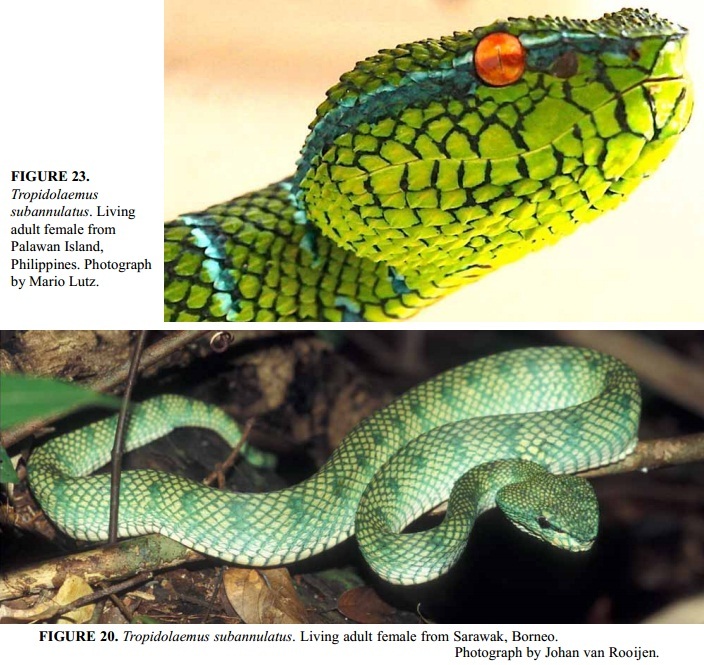 The status of the Thai palm viper, Trimeresurus wiroti. Bulletin of the Maryland Herpetological Society , 27 (3), 146–156. Bone remains and a trackway of Pantheraichnus bottropensis nov. ichg. ichnsp. of the Late Pleistocene lion Panthera leo spelaea (Goldfuss, 1810) have been recovered from Bottrop and other open air sites in northern Germany. Some of these bones are from open air hyena den sites. A relative high proportion of lion bones (20%) exhibit bite, chew or nibble marks, or bone crushing and nibbling caused by a large carnivore. Repeated patterns of similar bone damage have been compared to bone remains found at hyena dens in gypsum karst areas and cave sites in northern Germany. Ice Age spotted hyenas have been the main antagonists and the main scavengers on lion carcasses. The remains appear to have been imported often by hyenas into their communal dens, supporting the theory of strong hyena-lion antagonism, similar to the well documented antagonism between modern African lions and spotted hyenas. Most of the lion bones from the open air hyena den at Bottrop are probably a result of such antagonism, as are the rare remains of these carnivores found within large hyena prey bone accumulations along the Pleistocene rivers. The Emscher River terrace also has the largest quantity of hyena remains from open air river terrace sites in northern Germany. Their cub remains, and incomplete chewed prey bones from mammoths and woolly rhinoceroses, typical of hyena activity, underline the character of these sites as cub-raising and communal dens, where their prey was accumulated along the riverbanks in a similar manner to modern African hyenas. 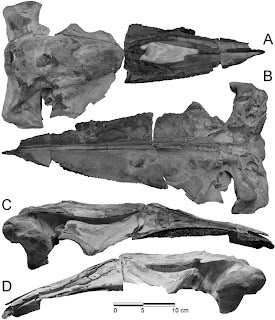 Holotype of Beiyanerpeton jianpingensis, gen. et sp. nov. a nearly complete skeleton in ventral view. 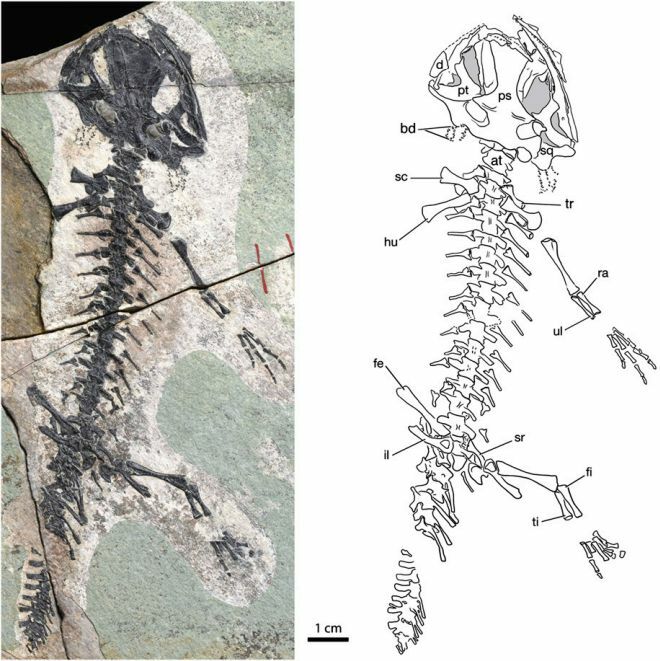 A Jurassic salamander, Beiyanerpeton jianpingensis (gen. et sp. nov.), from a recently found site in western Liaoning Province, China is the earliest known record of Salamandroidea. As a Late Jurassic record of the group, it extends the range of the clade by ~40 Ma. 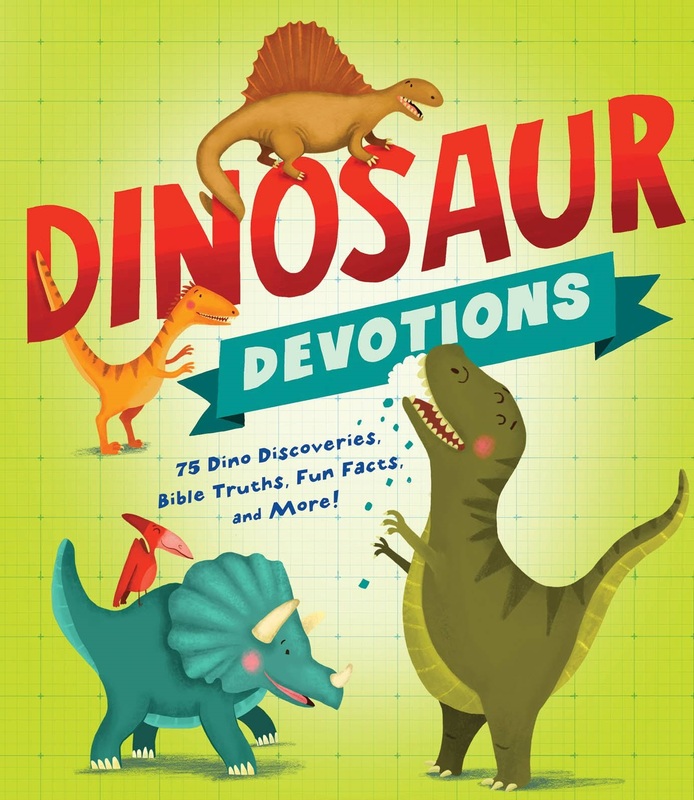 The Late Jurassic taxon is neotenic and represented by exceptionally preserved specimens, including fully articulated cranial and postcranial skeletons and bony gill structures close to the cheek region. 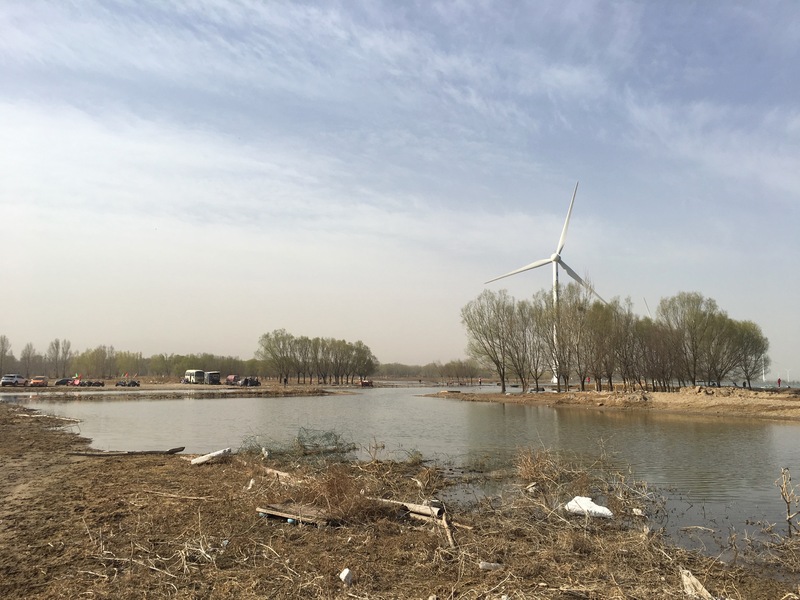 The fossil beds, consisting of dark-brown volcanic ash shales of the Upper Jurassic Tiaojishan (Lanqi) Formation (Oxfordian), underlie trachyandesite rocks that have yielded a SHRIMP zircon U-Pb date of 157 ± 3 Ma. The fossiliferous beds are substantially older than the Jehol Group, including the Yixian Formation (122–129 Ma), but slightly younger than the Middle Jurassic Daohugou horizon (164 ± 4 Ma). The early fossil taxon shares with extant salamandroids derived character states, including: separated nasals lacking a midline contact, angular fused to the prearticular in the lower jaw, and double-headed ribs on the presacral vertebrae. In contrast to extant salamandroids, however, the salamander shows a discrete and tooth-bearing palatine, and unequivocally nonpedicellate and monocuspid marginal teeth in large and presumably mature individuals. 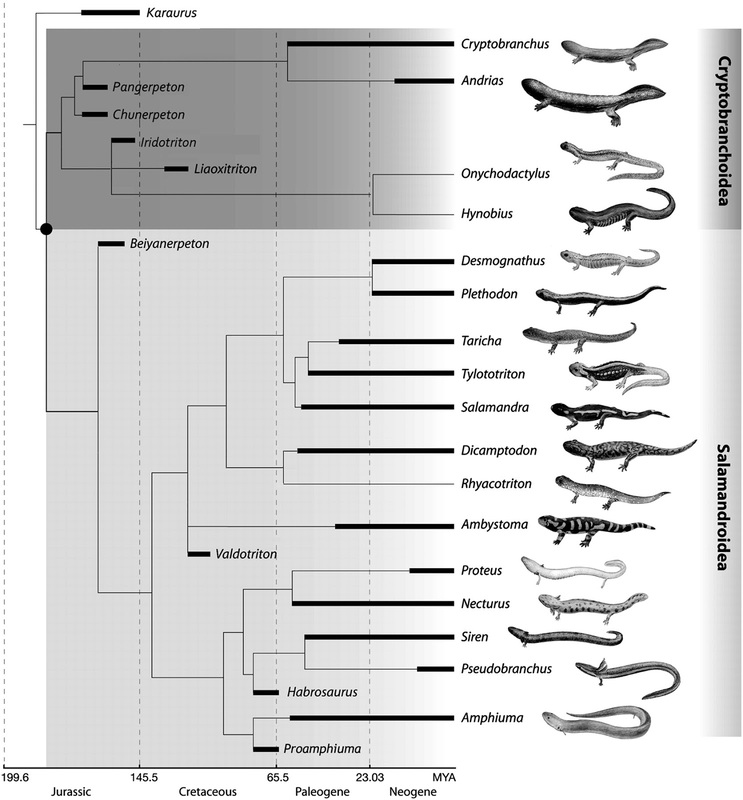 The ﬁnding provides insights into the evolution of key characters of salamanders, and also provides direct evidence supporting the hypothesis that the split between Cryptobranchoidea and Salamandroidea had taken placed before the Late Jurassic Oxfordian time. In this aspect, both paleontological and molecular data now come to agree. 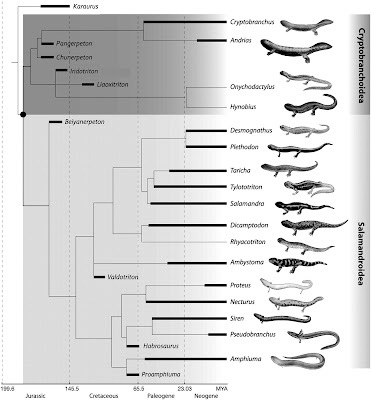 Calibrated cladogram showing the relationships of Beiyanerpeton to other fossil and extant salamander clades, and the timing of the Salamandroidea splitting from Cryptobranchoidea (solid dot) as indicated by the fossil record. Figure 2. Shell morphology of Pomacea maculata. A, lectotype of Pomacea insularum and neotype of Pomacea gigas: NHMUK 1854.12.4.313. B, C, paralectotypes of P. insularum in the d'Orbigny collection: NHMUK 184.12.4.312 (B), NHMUK 184.12.4.311 (C). D, syntype of Pomacea amazonica: NHMUK 20020645. E, Ampullaria canaliculata of Delessert, presumed to be Ampullaria gigas Spix by Mermod (1952) and others: MHNG 33489 (previously 1487/81). F, Possible syntype of Pomacea haustrum: NHMUK 20020660. Ampullariidae comprises two lineages of freshwater gastropods: one Old World and one New World. Recent molecular work confirmed the monophyly of the family and began to clarify generic relationships, but current systematics remains unsatisfactory. 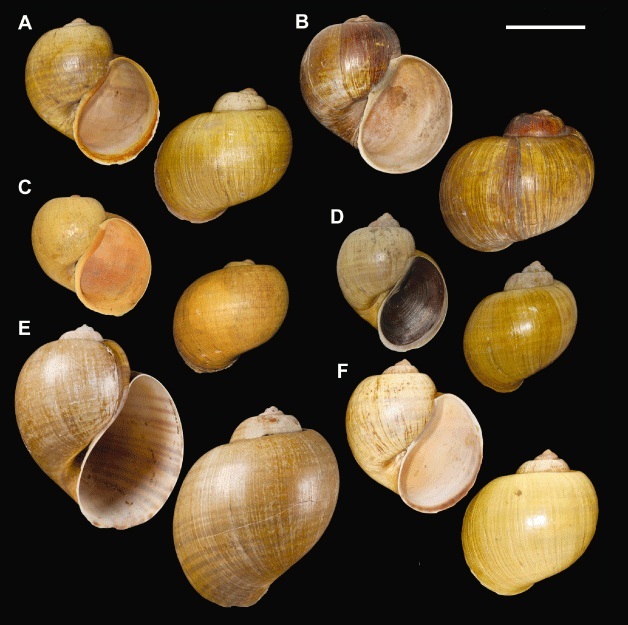 With more than 300 available species group names for New World taxa alone, taxonomic confusion is rampant, as illustrated by two species that have been introduced widely and are difficult to differentiate conchologically, Pomacea maculata Perry, 1810 and Pomacea canaliculata (Lamarck, 1822). Misidentification hampers efforts to manage their spread and impacts as invasives, and prevents meaningful comparative analyses of their biology. Here we clarify the taxonomy, describe the morphological and genetic distinctiveness of the two species, and re-evaluate their biogeographic ranges. They differ most clearly genetically, with no shared haplotypes and a mean genetic distance of 0.135 at cytochrome c oxidase subunit I (COI). Differences in shell morphology are most obvious in recently hatched juveniles; the number of eggs per clutch is higher in P. maculata, and the individual eggs are smaller, so P. canaliculata hatchlings are nearly twice as large as those of P. maculata. Adult shells differ primarily in the angulation of the whorl shoulder and pigmentation of the inner pallial lip, with the latter a distinctive feature of P. maculata. They also differ in reproductive anatomy, most notably in P. canaliculata having two distinctive glandular tissues in the apical penial sheath gland, and P. maculata lacking a medial sheath gland but possessing a basal sheath gland. Pomacea canaliculata is restricted to a narrower southern range, whereas P. maculata ranges extensively throughout much of South America. Ampullaria gigas Spix, 1827 and Ampullaria insularum d'Orbigny, 1835 are herein synonymized with P. maculata. Neotypes are designated for P. maculata and A. gigas, and a lectotype is designated for A. insularum. A neotype is designated for P. canaliculata. 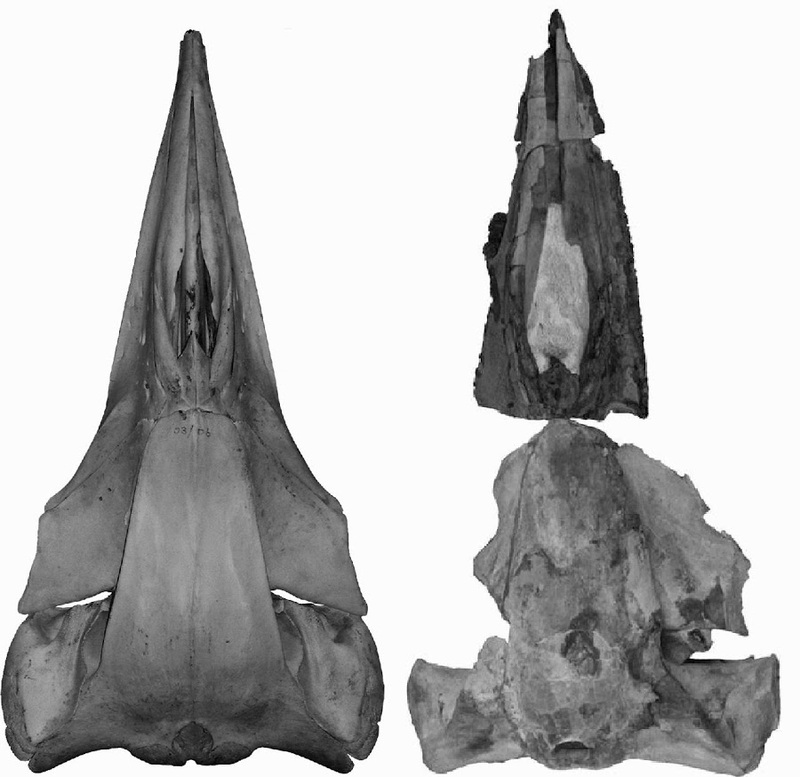 the skulls of Caperea (left) and Miocaperea (right), from Bisconti (2012). A fossil pygmy right whale (Cetacea, Mysticeti, Neobalaenidae) with exquisitely preserved baleen is described for the first time in the history of cetacean palaeontology, providing a wealth of information about the evolutionary history and palaeobiogeography of Neobalaenidae. This exquisitely preserved specimen is assigned to a new genus and species, Miocaperea pulchra gen. et sp. nov., and differs from Caperea marginata Gray, 1846, the only living taxon currently assigned to Neobalaenidae, in details of the temporal fossa and basicranium. 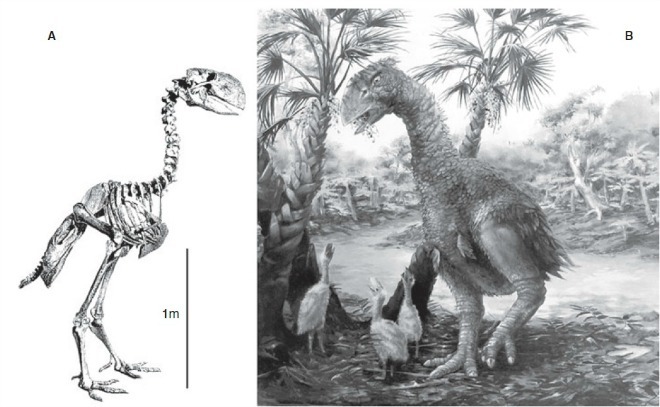 A thorough comparative analysis of the skeleton of M. pulchra gen. et sp. nov. and C. marginata is also provided, and forms the basis of an extensive osteology-based phylogenetic analysis, confirming the placement of M. pulchra gen. et sp. 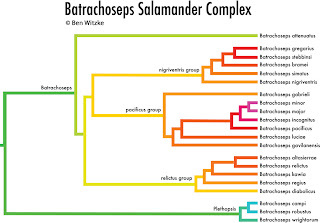 nov. within Neobalaenidae as well as the monophyly of Neobalaenidae and Balaenidae; the phylogenetic results support the validity of the superfamily Balaenoidea. No relationship with Balaenopteroidea was found by the present study, and thus the balaenopterid-like morphological features observed in C. marginata must have resulted from parallel evolution. The presence of M. pulchra gen. et sp. nov. around 2000 km north from the northernmost sightings of C. marginata suggests that different ecological conditions were able to support pygmy right whale populations in what is now Peru, and that subsequent environmental change caused a southern shift in the distribution of the living neobalaenid whales. ป้ายกำกับ: 2012, Cetacea - whale; dolphin, Mammalogy, Miocene, Paleomammalogy, Peru, Prehistoric mammal, South America, Zool. J. Linn. Soc. In this paper, a new genus Neoheterophrictus gen. nov., with three new species, Neoheterophrictus crurofulvus sp. nov., N. sahyadri sp. nov. and N. uttarakannada sp. nov., is described from Uttara Kannada District, Karnataka, India. The new genus is close to Heterophrictus Pocock, 1900 and Plesiophrictus Pocock, 1899 but has multilobed spermathecae, which was consistent in all the three species and the males possessing double tibial spur. Natural history information for all the species described is provided. We transfer Plesiophrictus bhori Gravely, 1915 to Heterophrictus and synonymise P. mahabaleshwari Tikader, 1977 with Heterophrictus milleti Pocock, 1900. Keywords: Eumernophorinae, Heterophrictus, new genus, new species, Plesiophrictus, tarantula, taxonomy, Theraphosidae. 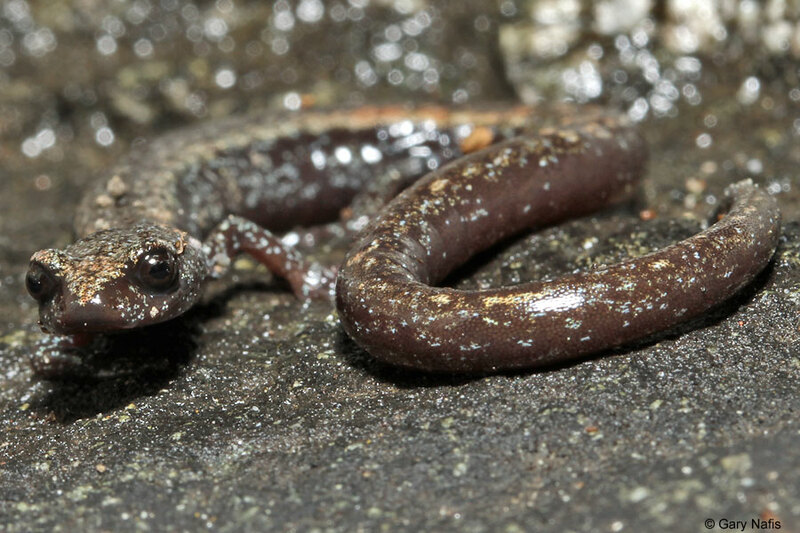 Populations of robust salamanders belonging to the plethodontid salamander genus Batrachoseps (subgenus Plethopsis) from the southern Sierra Nevada and adjacent regions represent a previously unknown species here described as Batrachoseps robustus. The new species is robust, with a short trunk (17–18 trunk vertebrae) and well-developed limbs. 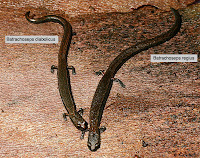 It differs from its close geographic neighbor, Batrachoseps campi, in lacking patches of dorsal silvery iridophores and in having (typically) a lightly pigmented dorsal stripe, and from Batrachoseps wrighti in being more robust, having more trunk vertebrae, and in lacking conspicuous white spots ventrally. This species is widely distributed on the semiarid Kern Plateau of the southeastern Sierra Nevada and extends along the east slopes of the mountains into the lower Owens Valley; it also is found to the south in the isolated Scodie Mountains. It occurs at high elevations, from 1615–2800 m, in areas of low rainfall and high summer temperatures. Wake, D.B., Yanev, K.P. & Hansen, R.W. 2002. 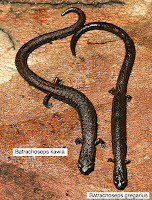 New species of slender salamander, genus Batrachoseps, from the southern Sierra Nevada of California. Copeia, 2002, 1016–1028. Figure 2. Examples of nonadaptive radiations (i.e. collections of related ecologically similar species that are allopatric or parapatric replacements of one another, also known as allospecies). 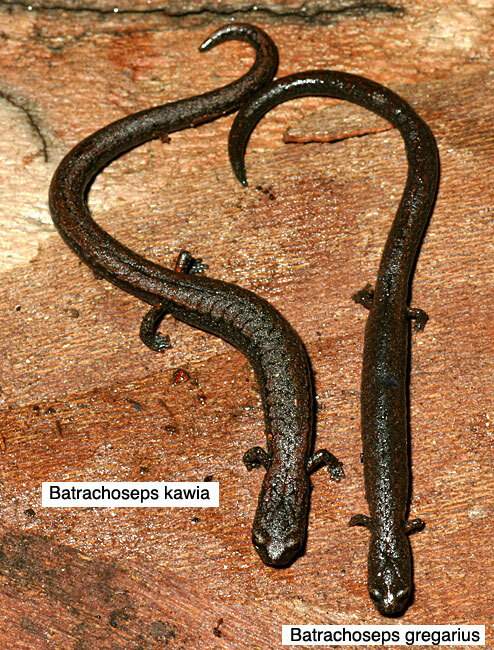 (a) Batrachoseps salamanders (Plethodontidae) of western North America (from top: Batrachoseps gavilanensis, B. luciae, B. incognitus, B. minor). Species are genetically different, and some of the illustrated taxa might be separated by >10 million years. Species recognition is possibly based on pheromones. 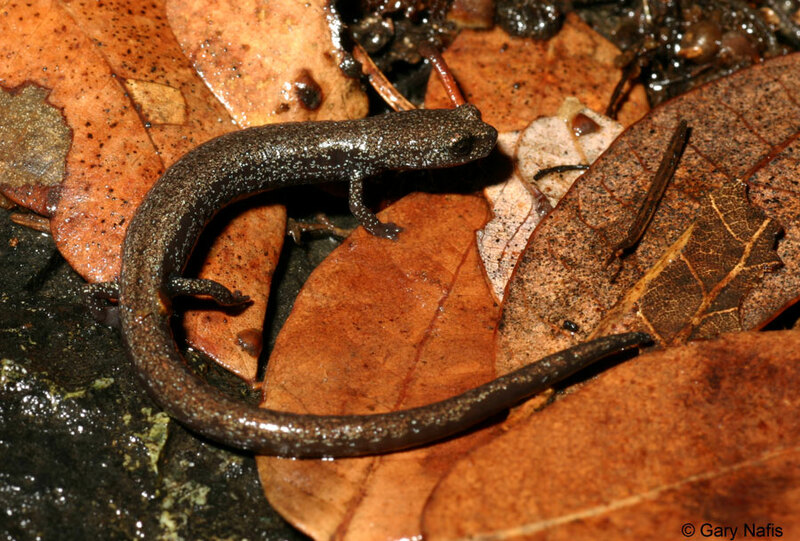 Plethodontid salamanders of the genus Batrachoseps comprise a clade of morphologically similar, elongate species whose great genetic diversity is being revealed through molecular studies. We used allozymes and mtDNA sequences to study variation in 62 populations from central coastal California, treated most recently as members of the B. pacificus complex. Analyses of mtDNA data identify four lineages that are well differentiated from each other and do not form a monophyletic group. Instead, the central coastal lineages are multiply paraphyletic with respect to the southern California members of the pacificus group. 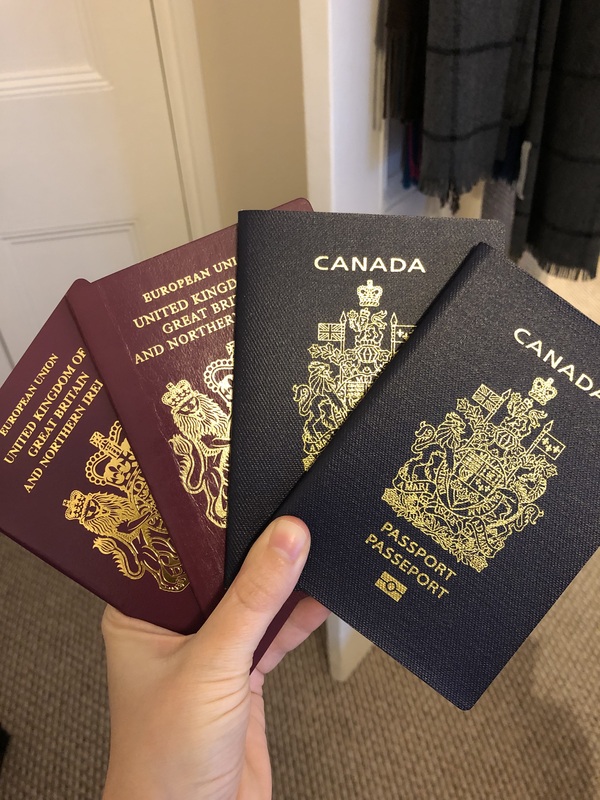 Marked allozymic differences show that these four lineages are strongly differentiated, although some limited gene exchange may have occurred in the past. Each lineage is also morphologically distinctive, but the differences between them are subtle. Because these lineages appear to be evolving independently, we describe them as new species: B. luciae, B. incognitus and B. minor, distributed parapatrically from north to south in the Santa Lucia Mountains of coastal Monterey and San Luis Obispo Counties, and B. gavilanensis, occurring mainly inland from the range of B. luciae, centered on the Gabilan Mountains, but also extending to the Pacific coast at the north end of the range of the complex, along the northern border of Monterey Bay. 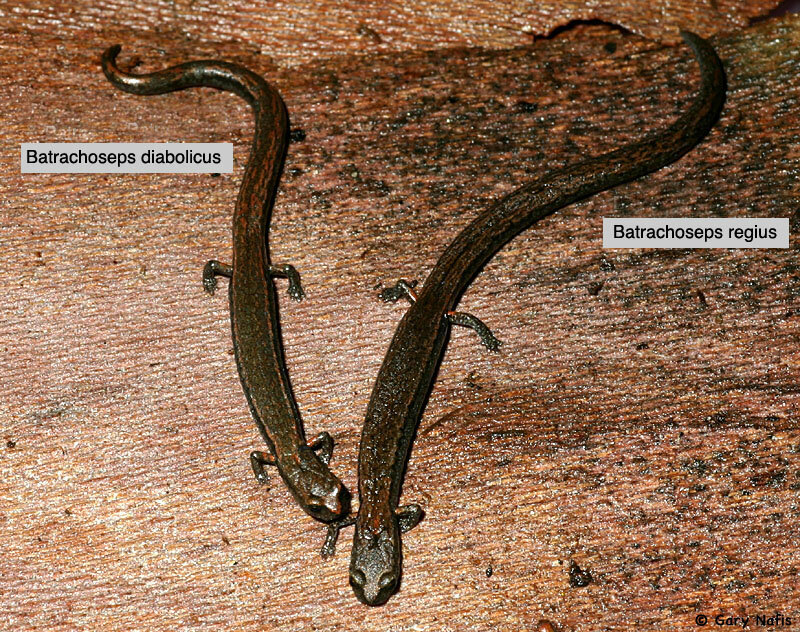 Although no sympatry is known among any of the new species, B. luciae and B. gavilanensis are narrowly parapatric. Furthermore, all but B. luciae occur in sympatry with other members of the genus in at least a part of their geographic ranges. The new species may have arisen vicariantly with respect both to each other and to related forms in southern California, in part as a result of the dramatic tectonic movements that have characterized the last 15 million years of geological history in western North America. Jockusch, E.L., Yanev, K.P. and Wake, D.B. 2001. 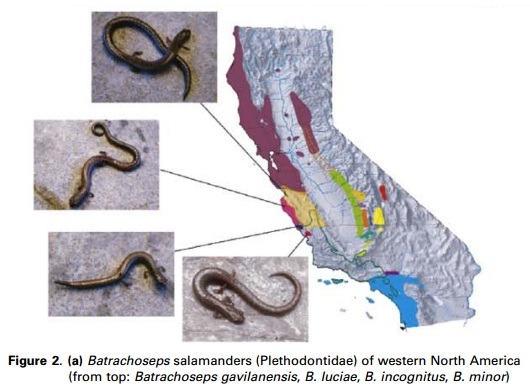 Molecular phylogenetic analysis of slender salamanders, genus Batrachoseps (Amphibia: Plethodontidae), from central coastal California with descriptions of four new species. Herpetological Monographs. 54-99. Jockusch, E.L., Wake, D.B. and Yanev, K.P. 1998. New species of slender salamanders, Batrachoseps (Amphibia: Plethodontidae), from the Sierra Nevada of California. Natural History Museum of Los Angeles County - Contributions in Science: 1-17. The marsupial family Diprotodontidae (Diprotodontia, Vombatiformes) is a group of extinct large-bodied (60–2500 kg) wombat-like herbivores that were common and geographically widespread in Cenozoic fossil deposits of Australia and New Guinea. Typically they are regarded to be gregarious, terrestrial quadrupeds and have been likened in body form among placental groups to sheep, rhinoceros and hippopotami. Arguably, one of the best represented species is the zygomaturine diprotodontid Nimbadon lavarackorum which is known from exceptionally well-preserved cranial and postcranial material from the middle Miocene cave deposit AL90, in the Riversleigh World Heritage Area, northwestern Queensland. Here we describe and functionally analyse the appendicular skeleton of Nimbadon lavarackorum and reveal a far more unique lifestyle for this plesiomorphic and smallest of diprotodontids. Striking similarities are evident between the skeleton of Nimbadon and that of the extant arboreal koala Phascolarctos cinereus, including the powerfully built forelimbs, highly mobile shoulder and elbow joints, proportionately large manus and pes (both with a semi-opposable digit I) and exceedingly large, recurved and laterally compressed claws. Combined with the unique (among australidelphians) proportionately shortened hindlimbs of Nimbadon, these features suggest adept climbing ability, probable suspensory behaviour, and an arboreal lifestyle. At approximately 70 kg, Nimbadon is the largest herbivorous mammal to have occupied the forest canopies of Australia - an ecological niche that is no longer occupied in any Australian ecosystem and one that further expands the already significant niche diversity displayed by marsupials during the Cenozoic. 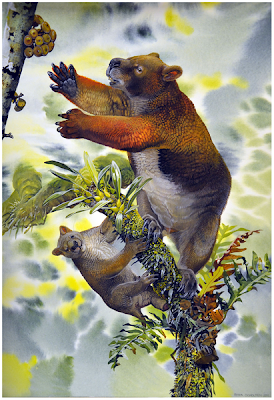 According to a new research led by Dr Karen Black of the University of New South Wales, Nimbadon lavarackorum – a large bear-like animal that lived in Australia’s lush forests 15 million years ago – was well suited to life in the treetops: it used massive sharp claws to haul its hefty body up trees, hugging the trunk like a bear, and its huge hands and long arms let it hang from branches like an orangutan. Preservation of fossil vertebrates in volcanic rocks is extremely rare. An articulated skull (cranium and mandible) of a rhinoceros was found in a 9.2±0.1 Ma-old ignimbrite of Cappadocia, Central Turkey. The unusual aspect of the preserved hard tissues of the skull (rough bone surface and brittle dentine) allows suspecting a peri-mortem exposure to a heating source. Here we describe and identify the skull as belonging to the large two-horned rhinocerotine Ceratotherium neumayri, well-known in the late Miocene of the Eastern Mediterranean Province. Gross structural features and microscopic changes of hard tissues (bones and teeth) are then monitored and compared to the results of forensic and archaeological studies and experiments focusing on heating effects, in order to reconstruct the hypothetical peri-mortem conditions. Macroscopic and microscopic structural changes on compact bones (canaliculi and lamellae vanished), as well as partial dentine/cementum disintegration, drastic enamel-dentine disjunctions or microscopic cracks affecting all hard dental tissues (enamel, cementum, and dentine) point to continued exposures to temperatures around 400–450°C. Comparison to other cases of preservation of fossil vertebrates within volcanic rocks points unambiguously to some similarity with the 79 AD Plinian eruption of the Vesuvius, in Italy. A 9.2±0.1 Ma-old pyroclastic density current, sourced from the Çardak caldera, likely provoked the instant death of the Karacaşar rhino, before the body of the latter experienced severe dehydration (leading to the wide and sustainable opening of the mouth), was then dismembered within the pyroclastic flow of subaerial origin, the skull being separated from the remnant body and baked under a temperature approximating 400°C, then transported northward, rolled, and trapped in disarray into that pyroclastic flow forming the pinkish Kavak-4 ignimbrite ~30 km North from the upper Miocene vent. An international team of paleontologists has unearthed the skull of a large rhino that perished in a volcanic eruption about 9.2 million years ago in what is now Turkey. 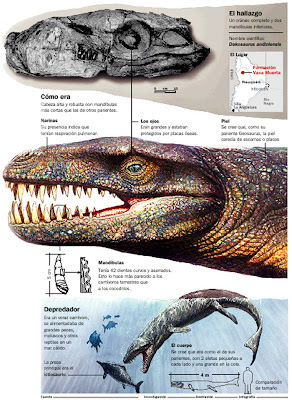 Remains of the marine crocodyliform Dakosaurus andiniensis from western South America reveal a lineage that drastically deviated from the skull morphology that characterizes marine crocodyliforms. The snout and lower jaw are extremely robust, short, and high and only bear a few large teeth with serrated edges (resembling those of some terrestrial carnivorous archosaurs). This unusual morphology contrasts with the long and gracile snout and lower jaws bearing numerous teeth, which are present in the closest relatives of D. andiniensis (and interpreted as indicating feeding on small fish or mollusks). 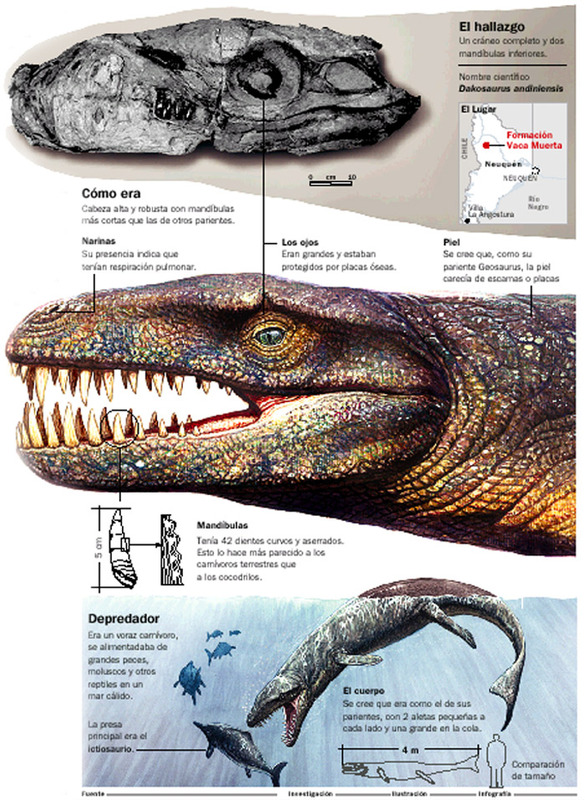 Thus, the morphological diversity of pelagic marine crocodyliforms was wider than had been thought. 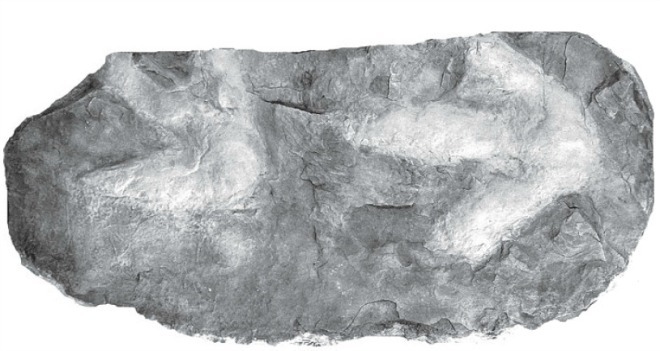 Tridactyl bird footprints preserved in Lower Eocene sandstone of the Chuckanut Formation in Whatcom County, Washington, USA, were made by a species of giant ground bird that walked along the subtropical lowland riverbank. The morphology and age of the tracks suggest the track maker was Diatryma (? = Gastornis). 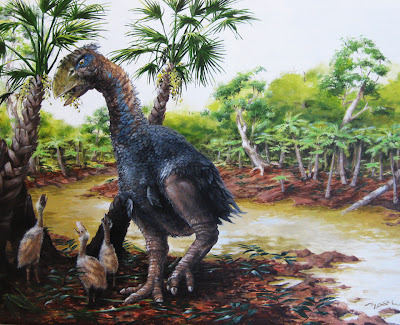 Although these birds have long been considered to be predators or scavengers, the absence of raptor-like claws supports earlier suggestions that they were herbivores. 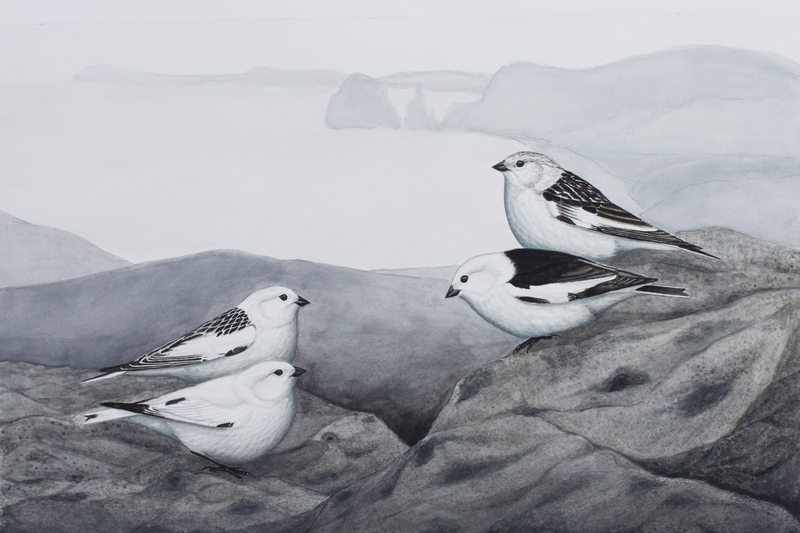 The Chuckanut tracks are herein named as Rivavipes giganteus ichnogenus and ichnospecies nov., inferred to belong to the extinct family Gastornithidae. Sea snakes have some of the most potent venoms of any snake, but most of the 60 or so species are docile, rare, or sparing with their venom. 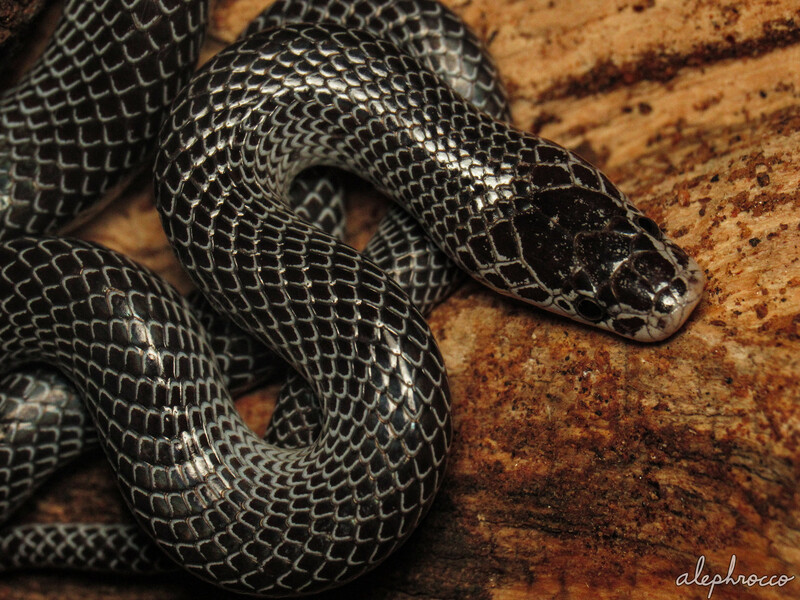 The beaked sea snake (Enhydrina schistosa) is an exception. It lives throughout Asia and Australasia, has a reputation for being aggressive, and swims in estuaries and lagoons where it often gets entangled in fishing nets. Unwary fishermen get injected with venom that’s more potent than a cobra’s or a rattlesnake’s. It’s perhaps unsurprising that this one species accounts for the vast majority of injuries and deaths from sea snake bites. We present a striking case of phenotypic convergence within the speciose and taxonomically unstable Hydrophis group of viviparous sea snakes. Enhydrina schistosa, the ‘beaked sea snake’, is abundant in coastal and inshore habitats throughout the Asian and Australian regions, where it is responsible for the large majority of recorded deaths and injuries from sea snake bites. Analyses of five independent mitochondrial and nuclear loci for populations spanning Australia, Indonesia and Sri Lanka indicate that this ‘species’ actually consists of two distinct lineages in Asia and Australia that are not closest relatives. As a result, Australian “E. schistosa” are elevated to species status and provisionally referred to Enhydrina zweifeli. Convergence in the characteristic ‘beaked’ morphology of these species is probably associated with the wide gape required to accommodate their spiny prey. 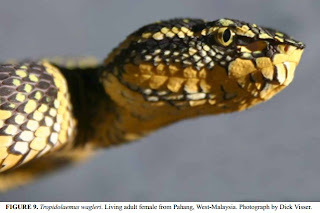 Our findings have important implications for snake bite management in light of the medical importance of beaked sea snakes and the fact that the only sea snake anti-venom available is raised against Malaysian E. schistosa. Highlights ► We present a striking case of phenotypic convergence within viviparous sea snakes. ► Enhydrina schistosa is distributed throughout the Asian and Australian seas. ► We analysed five independent mitochondrial and nuclear loci. ► Enhydrina schistosa consists of two independent lineages in Australia and Asia.